Diamond Candles are great for any occasion. You can even get the opportunity to get a ring inside the soy candle worth $10-$5000. Bloggers is is your opportunity to review a candle worth talking about. 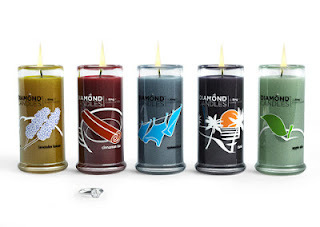 Diamond Candles retail for $24.95. You can visit them to check their different scented candles at Diamond Candles. To get the opportunity to review Diamond Candles visit them at here. Leave me a comment below that you have applied for this opportunity. Also let me know what Diamond Candles scent you'd love?